Daedalic Entertainment’s story-driven sci-fi adventure, State of Mind, is rapidly approaching its release date. At E3, Daedalic showed off a few samples of gameplay and gave us a look into a future that is detailed, engaging, and doesn’t require as much suspension of belief as you might think. State of Mind is the next step up from Daedalic’s past point-and-click adventures, and this game utilizes a heavily styled 3D design combined with investigation and exploration driven gameplay. It’s also quite dialogue-intensive, and designed to attract fans of single-player narrative-heavy titles. The peek we got at E3 showed gameplay with two different playable characters: a journalist named Richard and his unknowing semi-copy, Adam. The two characters already make for some interesting storytelling possibilities, and they’re only two out of six characters that players will be able to pilot during the game. Developers also emphasized that State of Mind thoroughly explores the idea of Trans-humanism. A main point of the story is the copying and uploading of a human’s consciousness into a digital world, and another body. Players will be engaged on the social and political implications of such technology, and will even have to decide in the course of playing what a digital life is worth. State of Mind also stands out with its references to tech that could very well be operational in the game’s primary setting of 2048. Look no further than today’s Google Glass, or research into human-like robotics and AI. With this sci-fi comes with a dose of realism: the technology that is embedded in this future is for the most part tech that has already been conceived and in some cases is being tested our present day. The game’s writer, Martin Ganteföhr, actively researched this line of technological development for years before writing State of Mind, and it looks like that research will pay off nicely in the game’s narrative. Beyond a multi-layered story, players can expect gameplay made up of character-oriented mini-games amidst the storytelling. For example, mini-games encountered when playing as Richard will likely involve laying out and putting together clues you’ve collected, as you’re playing a journalist. The game will apparently feature a wide variety of mini-games and require players to do a fair bit of puzzle-solving. All in all, State of Mind is shaping up to be an intriguing intellectual narrative. Even the look of the game is steeped in meaning: State of Mind boasts an old-school, low-poly look for characters and realistic environment. On its own, it looks pretty cool, but Daedalic is also making a point. 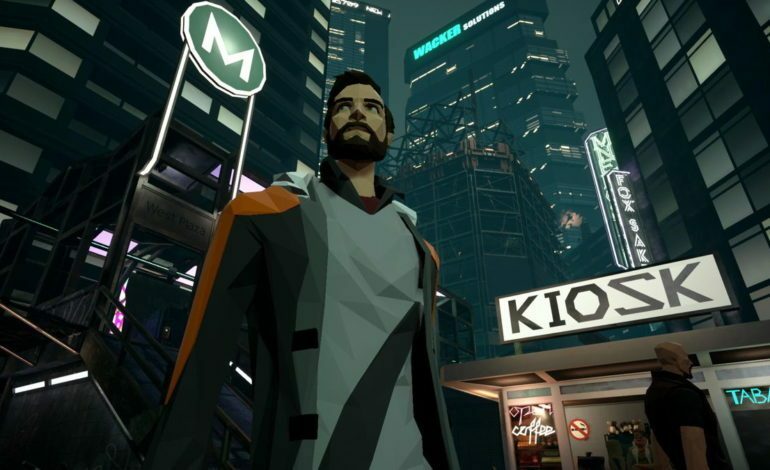 In a world where people can be deconstructed and uploaded as data, a low-poly look emphasizes the malleable pieces each character can be broken into. State of Mind is coming out this August for the PC (plus Mac and Linux), Xbox One, PlayStation 4, and and Nintendo Switch. It’s got an estimated 18 hours of gameplay in total, including mini-storylines that players can explore if they’re feeling ambitious; if you decide to stick with the main story, the game can be finished faster. State of Mind is available for pre-order now on Steam and GOG.